Since writing about the 4/20 Munchathon on Friday, I had one thing on my mind and one thing only - the almighty Mac 'n Cheese burger. This unapologetically gluttonous dish, which is so appropriate for the occasion had both Dan and me wondering how its legend would live up to the hype. Luckily, we were there to experience it first hand, and I'm happy to report back that it didn't disappoint. Sadly, what did disappoint deeply was the service, to the point of being unacceptable. But first...this bodacious burger. 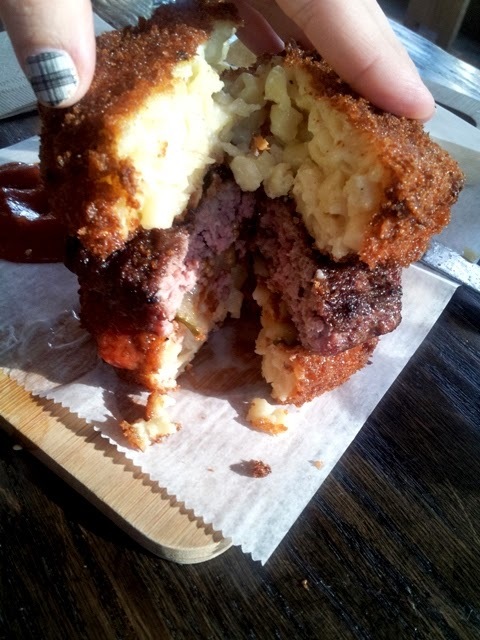 Mac 'n Cheese Burger - The idea behind this burger was ingenious. 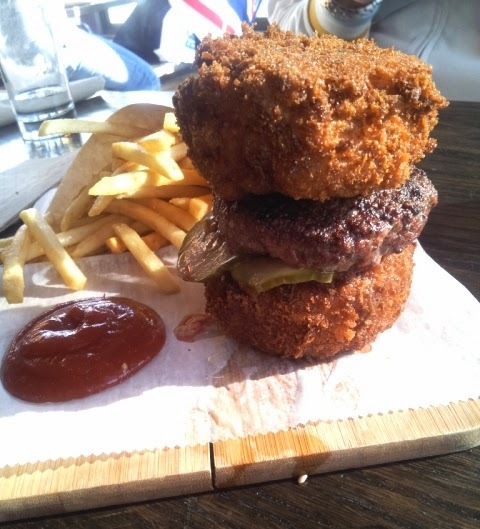 No doubt modeled by Keizo Shimamoto's ramen burger, Snowdonia's version entailed a fluffy mac 'n cheese bun croquette that sandwiched a juicy burger patty. It sounded too good to be true, but the execution didn't fall short of anything less than delicious. The mac 'n cheese portion was perfectly crispy on the outside and gooey on the inside. 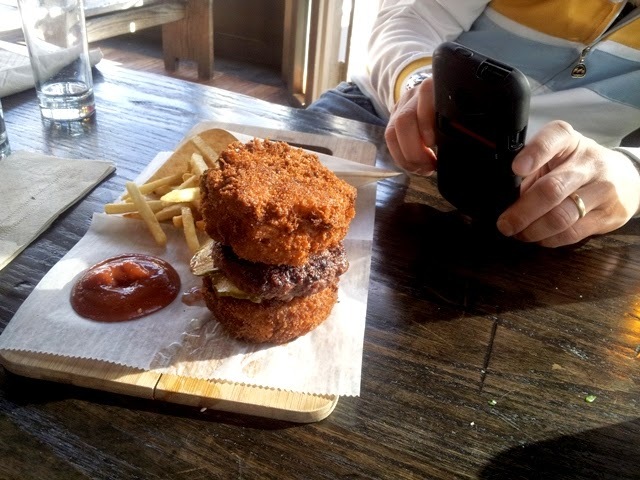 While it served as a nice companion to the burger, it was hard to take a bite of the two at the same time, as the mac 'n cheese bun was quite thick. Instead, we ate it all prim and proper with a fork and knife, thus, savoring every bite. Since it was so extravagantly indulgent, taking the sharing route was a great approach, even though probably a heresy as far as 4/20 behavior is concerned. As I hinted above, our service was terrible, almost embarrassing. While I waited for about 15 minutes just to get my pre-ordered drink, our waitress completely forgot it and then callously brought it over without acknowledging what happened. I also found it unacceptable and downright offensive when our waitress physically pushed me out of the way while I waited my turn for the restroom. A simple "excuse me," would've done the trick, and I was puzzled as to why I was treated with such disrespect. Further adding insult to injury, we used a buy one get one draft beer coupon, which was downright unrecognized. Instead of buying us a drink and apologizing, we were simply handed the bill and informed that the coupon wasn't applied. I can go on further, but I think you get the point. Costs are fair, given the uniqueness of the food and the variety of cocktails and beers. We paid a total of $53 for about 4 drinks, hummus fries and that godly burger. No tip left or deserved. I am so glad you pointed out the issues with the service staff. My roommate and I have been there twice and found the place to be far too casual in its attention to customers. The atmosphere feels very much like a friendly neighborhood bar, so much so that the wait staff seems to view themselves as a part of the clientele, often giving more attention to the conversation their friends are having at the bar than anyone seated at tables. Thankfully, there are plenty of out-of-this world restaurants and beer bars in our 'hood. I unfortunately agree - the place has so much potential, but service is a huge part of the experience. It fell way short yesterday and other times I've been, as well.